A new website launches shortly making it easier to make reservations through Facebook and 10 Chairs NYC website. See you in the new year. Oh yes December 21, is the last dinner of the year. I have your chairs waiting. Ten chairs, five flavorful courses, a little sparkling wine and one… ballet dancer? 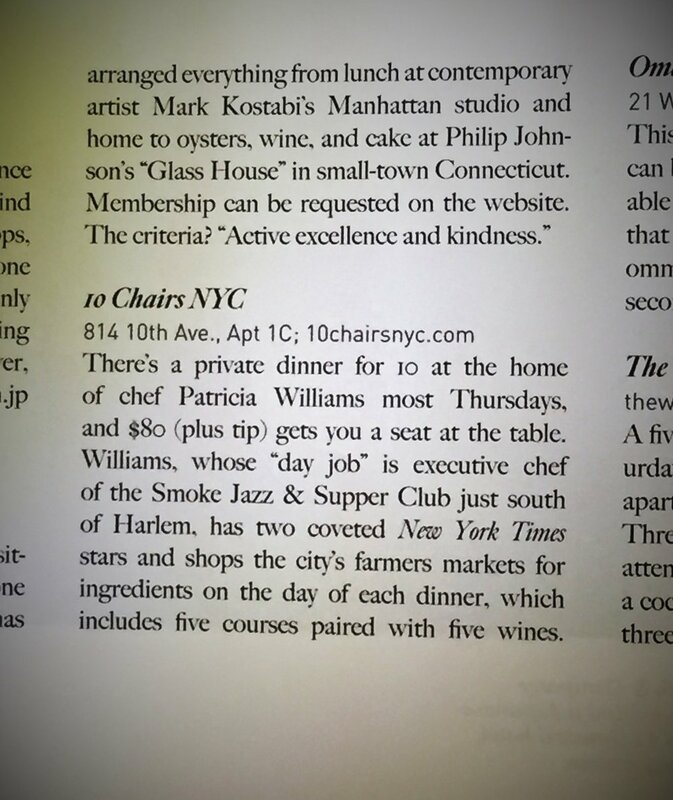 That’s the distinctive recipe behind 10 Chairs NYC, the boutique dining concept developed and presented by chef Patricia Williams. Like the plot of a classic three-act ballet, the route to this former professional dancer’s current position was rather circuitous and, at times, grueling. 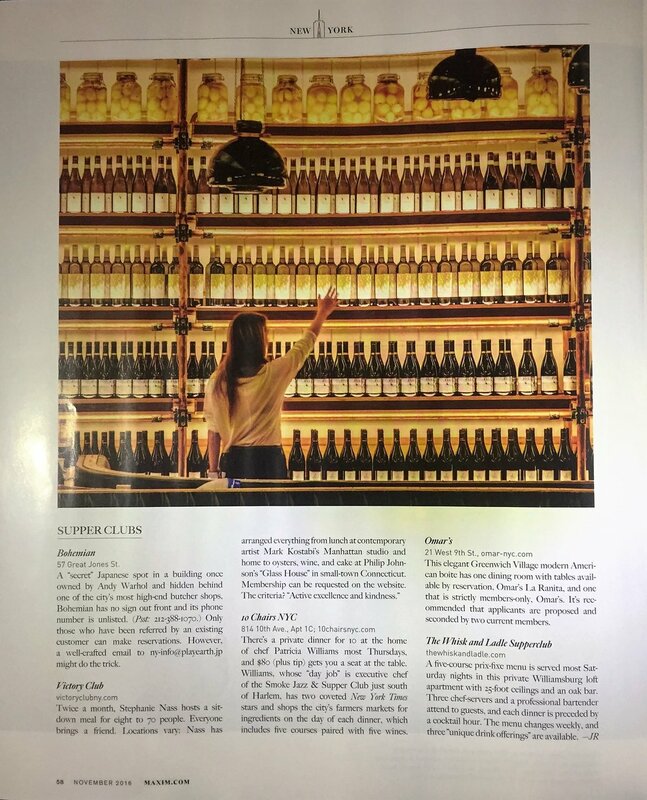 Nonetheless, what began three and a half years ago as a passion project has evolved into a self-sustaining business, tangible evidence that the right combination of vision, tenacity and persistence can pay off. Home from the sea and the abundance of beauty on the Long Island Sound. Creating new venues for the fall/winter season, October 5 will be the first dinner of the season. As many of you know, my previous career as a ballet dancer and one of the companies was Harkness Ballet Company.” An American Ballet Story” is being written about the Harkness Ballet and I am featured in the film. The director of the company will be in New York to share my story” After The Ballet”. Leslie Streit will be attending the dinner October 5 and will see where my path has taken me post Harkness days. Ballet instilled in me drive, determination and the pursuit of excellence that has made 10 Chairs a success. So as I plan the menu as in a ballet there will be an adagio, allegro and a coda. Jete with me into October and we shall share a pas de dix. “DACA” We hear a lot about this word and what it means. Though I was born here I am a dreamer. I dreamed of moving to New York and becoming a ballet dancer and that came true. I dreamed of becoming a recognized chef and that came true. I dreamed of having my own restaurant and that is partially true. 10 Chairs NYC has led me in a new direction as my own boss and owner. So my dream has come true. Sitting in my garden surrounded by sun and flowers. Rarely do I sit and reflect on my surroundings. May brings out the best in everything. The trees are flowing and last year’s plants are breaking through the soil and reaching towards the sun. I look forward to the market and the bounty of the stalls brimming with green produce. I grew my first and only fiddlehead fern. The sight of the small green curly fern set the tone for the menu for the coming week. Rhubarb begins the meal pickled and paired with fennel, celery and cucumbers. Ramps, young asparagus, basil, new potatoes all herbs that will be a part of the upcoming menu. Vegetables and flowers comprise the dishes not as an accompaniment but as the main ingredients. Young asparagus paired with house smoked salmon, home made crème fraiche and chives. The risotto showcases the spring peas with a pop and grassy overtones. Strawberries finish the meal with simplicity and sweetness. Join me, the herbs, and the flowers for an exciting and mouthwatering menu on May 11. When it rains I am back in Texas and outside our back door. A large wooden rain barrel. You can smell rain and when it came what I remember is the fresh mint in the yard, the pecan trees, the figs, okra and many other edible weeds that grew in our backyard.My mother would make fig preserves for my toast in the morning and mint tea from leaves. These memories come flooding back when it rains. She would wash my hair with the water and we would be outside to pick pecans for pies, okra and other greens for dinner. I never thought about being chef at that point but I came from a family of food lovers. Aunts and uncles who fished, raised animals and had pot belly stoves with outdoor plumbing when I was in my teens. We would drive long distances to find the best ingredients and the best places to pick dewberries. “Watch out for the snakes” my mother would call after she had dressed me in my uncles wading boots that were way too big but kept the snakes at bay. Buckets of dewberries would be brought into the house for my Aunt Bobby’s famous dewberry cobbler. Bits and pieces of pork raised by my uncle would be tossed into a cast iron skillet with the greens. A hot skillet with bacon fat waiting for the cornbread and you could hear the sizzle as it hit the pan. The aroma in that small kitchen with the pot belly stove fueled only by wood stayed in your hair and clothes long after the simple meal finished. The other day, I walked to ballet class at Ballet Arts, an historic building that has housed artists and teachers since 1837. Located behind Carnegie Hall, it began as Studio 61, home to Lucia Chase, Jerome Robbins and George Balanchine: so many creative talents who seemed to see a world without limits. Many years ago I was a ballet dancer and still take class when my schedule permits. Going through the rigors of the combinations that begin with plies and end with grand allegro, has been a regimen since I was around 7. That day, in class, I ran into a very talented singer, actress, comedian, and dancer that I had not seen in a while. She looked fabulous and started to describe her diet to me. No sugar, alcohol, coffee etcetera. My first reaction was to run home, go though my pantry and toss out all those items. On second thought I could not imagine no wine, bread, coffee, or sugar and how limiting that would be. But, it sparked something in my thinking: why not reverse the idea of "limits" and use that reversal as a stimulus to strive towards a creative and limitless world? I hesitate to say the next menu will not eliminate all of those items. But, the idea of seeing a new perspective on the culinary arts, inspired me to think and reach out for new ideas. So as I sit writing the menu for the next 10 Chairs NYC, I am thinking without boundaries. Life can be about having options without kowtowing to the ideas of narrow thoughts and minds. Fall is definitely here today and the next menu is all about the season. When I write a menu it is an outline and not a finished product. Squash soup? What type of squash? What texture or flavor will I add to the soup? Smooth as in a bisque or chunky as a peasant soup with apples, leeks. Soup has so many possibilities and for this reason it can be an entire meal with a loaf of bread and a glass of wine.Today I made the chicken stock for the soup, slowly simmered bones and aromatics. A feeling of warmth and comfort fills the house as the simmering stock waits for the roasted squash, leeks and roasted pears. Transforming the lowly gourd into deliciousness. The end of Indian summer brings a new vegetable bounty. I am sharing the 10 Chairs menu and thoughts with you my friends. Join me on the fall journey.